Today’s Asian smartphone is not complete with mobile messaging apps. Personally speaking, there are more than ten installed on my phone but, in reality, most iPhone- or Android-owners are likely to have (and regularly use) one of Skype, WhatsApp, Kik, Line and more. Even for those that have a BlackBerry device (which remain popular in some areas of Asia and the Middle East in paticular), RIM’s propretary BBM (BlackBerry Messaging Service) will be one of, if not the, most used feature. Yet, despite what appears to be a rapidly saturating market of free calling and mobile messaging apps, the space still has potential for new arrivals, as the story of Taiwan’s Cubie testifies. Within the first two and a half months of its life, the messaging app rocketed past 2 million users, after initially hitting seven figures of downloads in just 35 days. Right now Cubie, which was started in late March 2012 by husband and wife duo Yenwen Feng and Cjin Cheng, is seeing between 10,000 and 20,000 downloads daily day. That’s impressive enough for the duo — who most recently started and sold Willmobile to Taiwanese IT firm Systex — to be fully pursuing the opportunity of mobile messaging. Rather than be daunted by the competition, they were inspired to develop a unique and focused offering that provides a different channel of communication for smartphone owners. “This is a huge market. There are lots of messaging apps, but we have our own angle and offer features that we think people want to use,” Feng explains. “We saw that people use a number apps to talk to different people and for certain types of communication, which gave us the idea for Cubie,” Cheng adds. While the mobile app space still nascent, the trend is more obvious on the more mature PC chat space. “For example, many use Skype for business but MSN Messenger is still popular for chatting with friends,” the pair tell me on the sidelines of the recent Echelon 2012 event, where Cheng took part in a number of panel sessions. Cubie has found success by differentiating itself from its competitors through strong branding and features that focus on a dedicated audience, females aged 18-35, thanks to similarities with smash hit Draw Something. “The drawing feature is very popular, but most users find the app appealing because of the things that their friends draw or the way that they customise it, so the appeal is really unique,” says Feng, who handles the technical side of the service. A core strength of Cubie’s viral appeal is that it is uses a Facebook-style friend suggestion system, which aims to connect friendship circles on the service. Given how ubiquitous messaging apps have become in Asia, services live or die based on the number of friends that use them, particularly as group chats are popular. On the plus side, Cubie is well placed to help bring peer-groups together, although the more-privacy concious smartphone owners (especially in the West) may object to being pushed to vague friends and acquaintances outside of their close circle to a messaging app. Another of Cubie’s unique facets is its more relaxed approach to messaging. 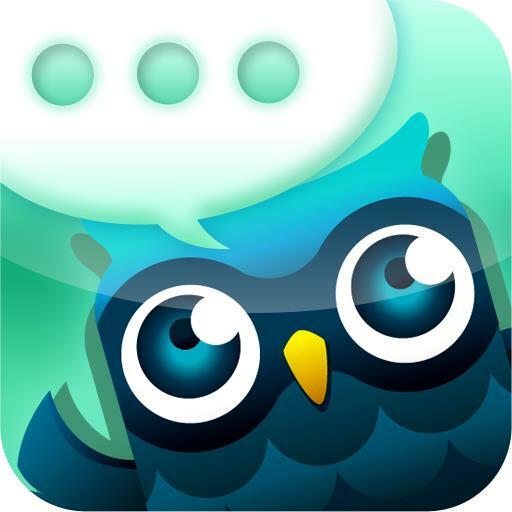 The app supports group chats (with up to 100 participants!) while videos, images and drawings can be shared between friends, however there are key differences. Users of WhatsApp and others are familiar with a layout which tells them when their contacts were ‘last seen online’ and actively using the app, while notifications also show when the other party is typing – as is common on IM services. These notifications have all been deliberately left out, while push-to-talk messaging is favoured over voice calls, as Cubie’s focus is very much on fun rather than an overload of information and features. 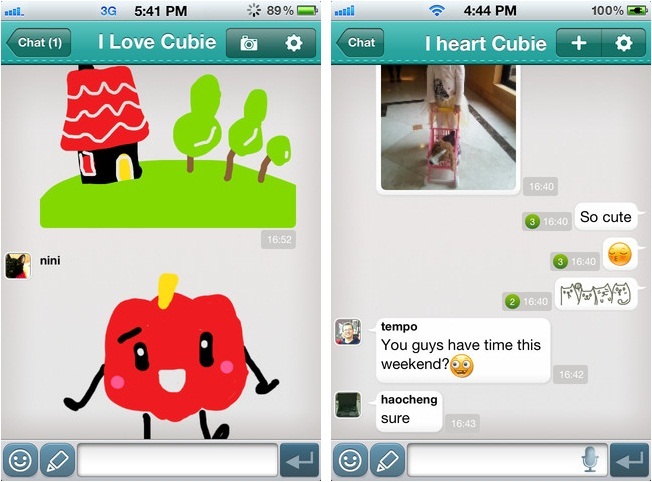 Initially, Cubie launched with a set of ‘Asiafied’ features, such as drawing, avatars, emoticons and stickers, but as the app drew popular they noted the most popular user base, and began tweaking the service to appeal to the biggest user demographic. “At last count, 73 percent of our user base was female so we changed our direction to enhance the female-appealing features,” Cheng reveals. Mobile messaging is really taking off in Asia. Line has seen more than 40 million downloads, predominantly across the continent, while Kakao Talk has 38 million members in Korea and close to 10 million in other markets. Tencent’s Weixin is also making a move out of China and into the English-speaking world through its WeChat app. That’s in addition to global heavyweights like WhatsApp, US-based Kik and even Skype, which has a popular mobile client. Despite the competition, the duo are bullish about the future of the market and Cubie’s stake in it, foreseeing that the captive user base could grow by more than ten-fold. With more than 2 million to Line’s 40 million, such growth would take Cubie past 40 million registered users, but for now the startup is focused on fine-tuning its app and continuing to grow. The app is available globally but Thailand, Malaysia, Singapore and its native Taiwan are where it is proven to be most popular, so far. The app was reviewed by a mainstream technology TV show in Thailand, which helped it gain enough visibility to enter the country’s top ten most downloaded iOS apps – from there, momentum is almost guaranteed. “We literally went from zero to being the top app in Thailand thanks to the coverage. From our experience in Taiwan and Singapore and elsewhere, once we hit top 10, downloads go very fast as people find it and share it among their friends. It begins to flatten out over time though,” Feng says. Cubie is focused on viral marketing tactics and, though the fast growth has slowed a little, they anticipate it will again increase when they hone in on other markets. For now, the focus remains on Southeast Asia where smartphone sales, of Android devices in particular, continues to grow at a rapid speed. In the longer term, however, established markets like the US and Japan are targets too. As a globally available app, Cubie already has users in these two countries — and more — but they see that the heavy Asia focus is an initial boundary that will restrict their potential there. Cubie is not currently monetising and, having just grabbed Angel funding from its native Taiwan, the founders are looking to continue to grow the app and its userbase. They admit that their revenue generation will probably be similar to other messaging apps, and cover areas like relevant ad-funded content and the sale of premium add-ons, such as stickers which are currently offered for free. Kakao Talk is set to launch a games center imminently, while Line is exploring the opportunity to tie-up with Hangame — fellow-NHN-owned games site — and the possibility of link-ups with games partners is one that could be logical, Feng admits. Carriers in Korea have been actively throttling Kakao Talk’s recently introduced free call feature, and introducing a calling option isn’t on Cubie’s radar, as they see the feature as “a risk” given its potential to challenge operator precious voice revenues. Certainly, if it can continue to maintain its focused appeal and impressive growth path into other Asian market, Cubie will grab the attention of other operators and potential fundraisers. Despite a focus on Southeast Asia, Cubie won’t be producing a BlackBerry app because, among other things, limited support for touch-screen devices wouldn’t allow them to offer their signature drawing feature. “Besides, iOS and Android are keeping us busy enough,” quips Cheng, but we imagine that comment is as true as anything else that the pair said during our meeting in Singapore.